Built on the west bank of the Nile River, between the first and second cataracts of the Nile, the site of Abu Simbel is one of the most recognizable ancient sites in Egypt. It contains two temples, carved into a mountainside, that were built by Pharaoh Ramses II (1303-1213 BCE), also known as Ramses the Great. The larger of the two temples contains four colossal statues of a seated Ramses II at its entrance, each about 69 feet (21 meters) tall. The entranceway to the temple was built in such a way that on two days of the year, October 22 and February 22, the light would shine into the inner sanctuary and light up three statues seated on a bench, including one of the pharaoh. It’s been hypothesized that the sun shining inside on these dates may commemorate his coronation and birth. 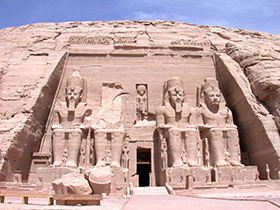 In addition to the main temple, Abu Simbel has a second, smaller, temple that was probably built for Queen Nefertari. Its front includes two statues of the queen and four of the pharaoh, each about 33 feet (10 meters) in height. Each is set between buttresses carved with hieroglyphs. While the site was built by an Egyptian ruler, and is located within modern-day Egypt, in ancient times the place it was located in was considered part of Nubia, a territory that was at times independent of ancient Egypt. Abu Simbel was built to be an imposing message to unwelcome visitors traveling on the Nile – Pharaoh is mighty and owns everything past this point, so respect his authority. Abu Simbel today is no longer in the same location as it was in ancient times. The area where the temples were originally located is now flooded. The temples were moved and raised to escape the rising water caused by the construction of the Aswan High Dam, built between 1960 and 1970. Between 1964 and 1968, the temples were dismantled and relocated on an artificial hill made from a domed structure that is 200 feet (64 meters) above and 600 feet (180 meters) west of their original site. This relocation project, completed under the direction of UNESCO, is one of the most impressive engineering feats in history. One consequence of the move is that the sun no longer shines on the interior of the temple exactly on the original commemorative dates. Due to the displacement of the temple and/or the accumulated drift of the Tropic of Cancer during the past 3,280 years, each of these two events has moved one day closer to the Solstice. Image: Abu-Simbel, Rosicrucian Egyptian Museum.